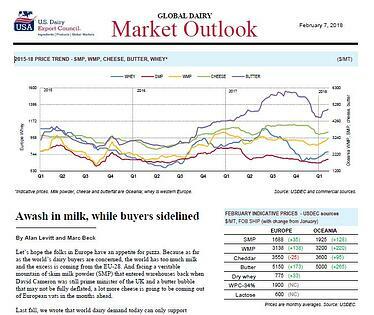 Editor's note: This article was excerpted from February’s Global Dairy Market Outlook, an USDEC publication providing expert analysis on the state of global dairy trade. Download the entire issue here. As far as the world’s dairy buyers are concerned, there’s too much milk and the excess is coming from the EU-28. Facing a veritable mountain of skim milk powder (SMP) that entered warehouses back when David Cameron was still prime minister of the UK and a butter bubble that may not be fully deflated, a lot more cheese is going to be coming out of European vats in the months ahead. 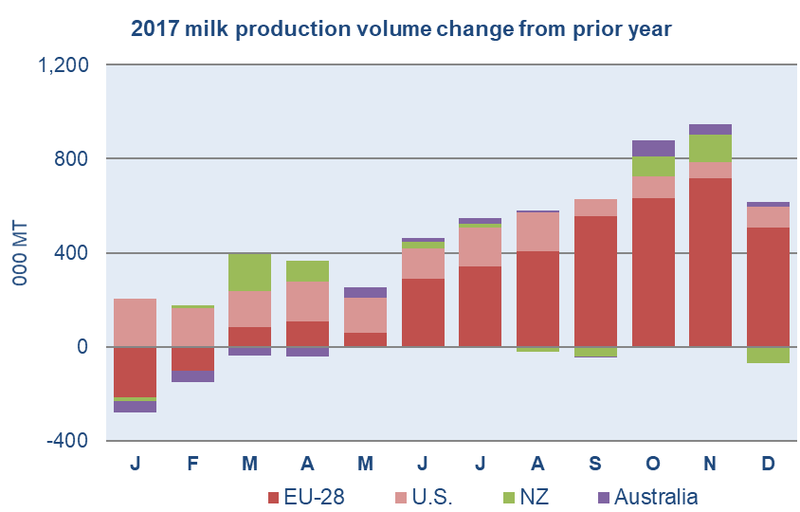 Last fall, we wrote that world dairy demand today can only support milk production growth from the major exporters of about 1.5 percent a year. In the second half of 2017, the growth rate from the EU-28, United States, New Zealand, Australia and Argentina was about double that. Since September, nearly all the surplus growth is coming from Europe. Source: USDEC and government reporting agencies. Some of the increase, of course, is a function of a weak comparable; recall the Commission paid farmers to cut back on production in the fourth quarter of 2016. But with processor payout prices that increased more than 30 percent in 2017, farmers have responded. Milk checks are coming down, but not quickly enough to stem the tide. A good flush is looming. And then there’s the matter of intervention stocks of SMP—still near 380,000 tons. The Commission confirmed it won’t add any more to the stockpile this year. That takes the floor price out, though it was already more than €300 below the fixed €1698 euro/ton price anyway. That means there’s some room to go down a little further, but it’ll take some other creative measure besides price—like food donation, feed use, overseas placement or something else—to clear the inventories. The United States, too, is sitting on record powder inventories that continue to grow. Year-end holdings were 150,000 tons, up 47 percent from the prior year. Alan Levitt is vice president of communications and market analysis at the U.S. Dairy Export Council. Marc Beck is USDEC executive vice president of strategy and insights.